We've updated our monthly workforce analysis to include Friday's Employment Report for January. The unemployment rate rose to 4.0%, and the number of new nonfarm jobs (a relatively volatile number subject to extensive revisions) came in at 304K. 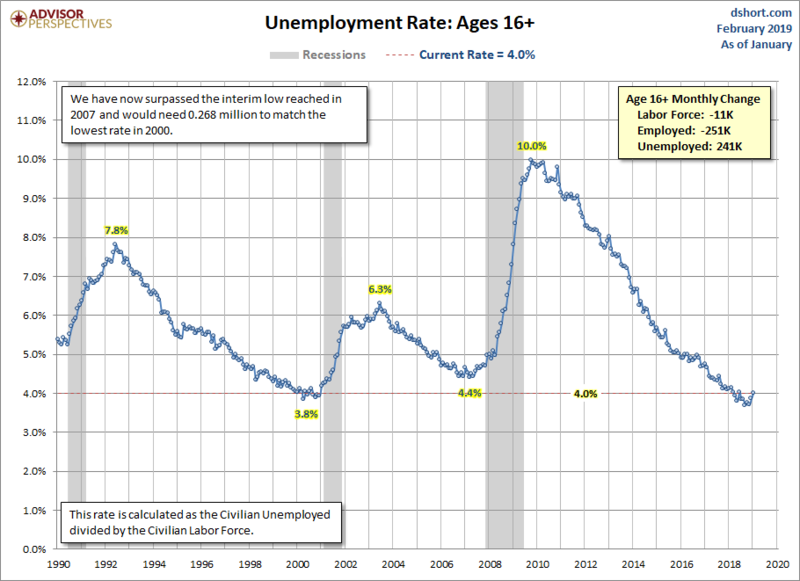 The closely watched headline unemployment rate is a calculation of the percentage of the Civilian Labor Force, age 16 and older, that is currently unemployed. Let's put this metric into its historical context. The first chart below illustrates this monthly data point since 1990. In the latest report, this indicator rose to 3.9%. The age 16+ population decreased by 649 thousand, and the labor force (the employed and unemployed actively seeking employment) decreased by 11 thousand. The number of employed decreased by 251 thousand and the ranks of the unemployed increased by 241 thousand. 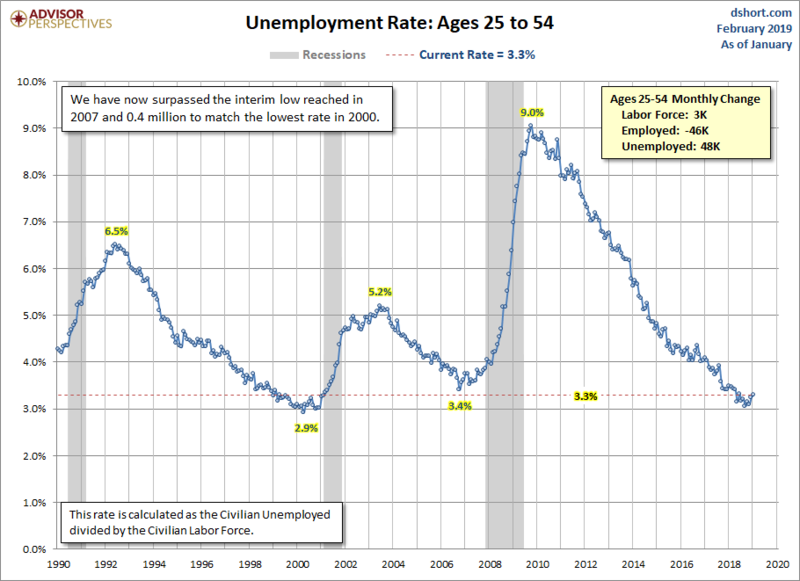 Let's look at the same statistic for the core workforce, ages 25-54. This cohort leaves out the employment volatility of the high-school and college years, the lower employment of the retirement years and also the age 55-64 decade when many in the workforce begin transitioning to retirement ... for example, two-income households that downsize into one-income households. In the latest report, this indicator is at 3.3% (to one decimal place), up from the previous month. The cohort population decreased by 400 thousand and the labor force increased by 3 thousand. The breakdown of the growth is a decrease of 46 thousand employed and a 48 thousand increase in the unemployed. A wildcard in the two snapshots above is the volatility of the Civilian Labor Force — most notably the subset of people who move in and out of the workforce for various reasons, not least of which is discouragement during business cycle downturns. The chart below continues to focus on our 25-54 core cohort with a broader measure: The Labor Force Participation Rate (LFPR). The LFPR is calculated as the Civilian Labor Force divided by the Civilian Noninstitutional Population (i.e., not in the military or institutionalized). Because of the extreme volatility of the metric, our focus is the 12-month moving average. This is a must read article. I personally believe that the low participation rate could be a function of increased multigenerational living. Child care costs could also be a factor.